A key piece of advice in Chasing the Ephemeral is take time to assess conditions at the base of the cliff before you start climbing. The ten minutes you spend at this point can be the most critical point of the day and make all the difference between success and failure. Forrest was pointing up towards West Buttress, which I had written off as a possibility as it is fully exposed to the sun late in the season. But sure enough, Gargoyle Chimney was fat with ice, and the gully line of Gargoyle Direct to its right, had an enticing thin white ribbon running down it. Now Gargoyle Direct does not climb the gully in its entirety, but follows the buttress to its right in its lower section, so this was too good an opportunity to miss. We ascended the lower tier by following the first two pitches of Quasimodo, which contained a thin layer of sticky ice and boded well for the climbing above. Forrest made short work of the lower gully finding good placements just where it mattered, and then made a bold set of moves through the icy overhang above. Gargoyle Direct re-joins the gully-line at a wide snow bay this point, but the gully splits just above, and I knew the narrow left branch was unclimbed. I remember looking down it from the neighbouring Bell’s Buttress one stormy day with Chris Cartwright and thinking it would make a good climb. The problem was the left branch was blocked by an impasse of huge chockstones forming a large roof draped in a spectacular frieze of icicles. Rather hopefully I climbed up underneath them and tried to excavate a way through, but the passage was far too narrow. There was nothing for it but to climb up the outside of the hanging icicle frieze. 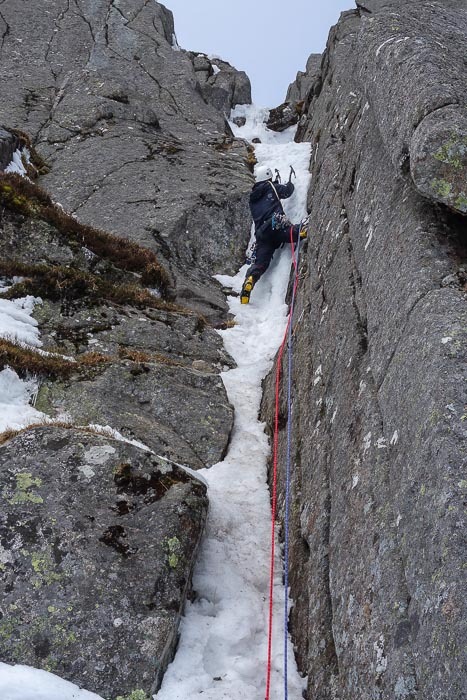 A short five-metre gully on the right gave access to the base of the icicles where a good crack miraculously appeared in the smooth wall that took a cam and a nut. Courage was in short supply, but the runners provided sufficient encouragement to pull onto the frieze, which promptly began to collapse under my feet. Fortunately the axe placements were good, and some wide bridging and a couple of frantic heaves took me up to some good turf and the top of a rather unlikely-looking pitch. Forrest made a strong lead of the left branch that narrowed to only 30cm wide at one section and soon we were in the amphitheatre with the Gargoyle winking at us from just below the plateau 30m above. Even though it was over 20 years ago, I can still remember leading the pitch up and right under the Gargoyle when Alastair Robertson and I made the first ascent of Quasimodo, and finding it tough. This time was no different, and it proved to be a battle with icy cracks and huge sheets of rime that occasionally detached and tried to pull me off as they fell through the ropes. We shook hands on top reflecting that Gryphon Grooves (VI,6) had been an excellent climb – sustained, interesting and somewhat unusual. But best of all, it was completely unexpected and the result of an eleventh hour route choice. The few minutes before you start climbing are precious and can be the most important part of the day!